Insignia client Cindy Kuesis, Insignia Project Manager, Ethan Axelson, and Insignia Owner & Designer, Connie Schey. Celebrating 26 years creating exceptional space design for our customers has earned us their trust and loyalty. Many of our clients recommend us to friends and family – the highest compliment we could receive. Essentially a customer is happy when the finished space expresses who they are and what they set out to achieve. The overall experience needs to run smoothly and be as low stress as is possible. With each opportunity we are awarded, Insignia delivers detailed and complete estimates to achieve top professional work on time and on budget for every client. Insignia’s team strives to raise the bar. Our award winning designers can partner with you to expand your vision and bring versatility to your ideas. Building relationships that last a lifetime. Standing behind our work. Bringing unmatched value to the Design/Build experience. That’s the mark of Insignia. Insignia Designers have won numerous coveted Design Vision Awards for the National Kitchen and Bath Association for highly inspired and functional designs. We had a remarkable experience with the Insignia team. Everyone involved with this project was extremely professional and just perfect. What a great transformation they created. Insignia Kitchen and Bath deserves a 5-star rating, due to its high level of professionalism. Everyone we worked with – the designer, project manager, and the tradesmen – was an absolute pleasure to work with. Their attention to details was amazing and we would recommend Insignia Kitchen and Bath without hesitation. Insignia Kitchen and Bath designed and supervised a total master bath renovation for me. The designer was easy to work with and knowledgeable about all the choices we needed to make along the way. Their finest moment came when they thought of a beautiful solution to a slight problem with the dye lots of the tiles. It was brilliant and I never would have thought of it on my own. Insignia really saved the day! I highly recommend working with Insignia. I used Insignia when I remodeled my master bathroom. Everyone that worked on the Insignia team was professional and well versed in their craft. I was extremely pleased with the results. I will use them again in the future and highly recommend their services. We were looking for a high end kitchen done by skilled professionals. That is exactly what Insignia provided from design through installation. Was a pleasure working with the carpenters, electricians, project leader and plumbers on a daily basis; they were all very professional, skilled and courteous. I had the pleasure of working with Insignia during the complete remodeling of our master bathroom. They were not only timely but the workmanship was impressive. I would highly recommend the Insignia crew. We hired Insignia to design and remodel our master bath. 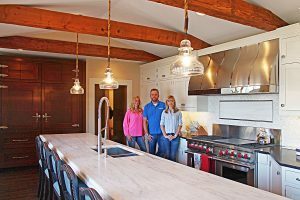 We needed our project to be completed fairly quickly and within a certain window and they were able to coordinate all of the necessary materials and contractors to create a wonderful room for us. Sheryl was amazing. She was able to slow down the process and focus on every conceivable detail, most of which we never even considered until she took control of the project. Sheryl had a very detailed step-by-step plan from colors and concept to actual schematics and design conception. Each phase was easy going and made the project come to life. Ethan was a pleasure to work with once the construction began. Will certainly go back to Insignia. I was impressed with Insignia from the first phone call. Designer Sheryl developed a plan that totally met my vision. Project Manager Ethan handled the unexpected events that occurred during installation. The showroom is brilliant because there are so many samples, it was comforting to pull the design together in 3D. What I am probably most impressed with is that the designer’s responsibilities did not end when the design was complete, nor did the project manager’s job start with installation – the team worked together continuously. Insignia worked with us on our small master bathroom renovation. Insignia did a great job in guiding us on décor, products and layout options while keeping an eye on the budget goals for the bathroom. As important, Sheryl made sure the renovation work went smoothly. Her professionalism and regard for customer satisfaction is a definite reflection of Insignia’s policies and approach to its clients. The design was great. We took our time looking at various options. Great workmanship and nice people to work with. I would use them again. Sheryl and the Insignia team helped bring our dreams of a beach-inspired spa like master bathroom to life. They assisted us in the design, material selections, project management and construction. The project was completed in a timely fashion and the constructions team was friendly, pleasant and respectful of our home. Every day the site was left clean and tidy, inside and out. We plan to do another project with Sheryl in the future. I worked with one of the designers from Insignia Kitchen and Bath. Every detail was done to perfection and everyone was knowledgeable, had great attitudes and met the deadlines. The project exceeded my expectations. The entire Interior Design Committee wishes to thank you for your incredible contributions to the Barrington White House project. The bathrooms, kitchen and entryway flooring are spectacular! The visitors often mention the kitchen and bathrooms. We are so very grateful that you were on board for this wonderful restoration and we will never forget your generosity. Pattie & I want to thank you and your talented staff for all the hard work, effort and time each and every one devoted to help us through a very difficult and overwhelming time. In the midst of our catastrophe, it was reassuring to know that Insignia and Professional Plumbing would go to great extremes to take very good care of us. The result was a first class job that was professionally completed. We would be more than happy to let anyone know what a first class operation you run. I thought you should know that your firm did a wonderful job on two bath remodels completed at our Barrington Hills home. Scheduling, material, budget were all overseen professionally by the designer and implemented by the staff. Insignia is one of the finest Kitchen and Bath studios in Chicagoland and we were indeed fortunate to be able to work with this kind of talent on our project. What a pleasure it was to work with your fine firm and your great staff in what was a really pleasant experience…and we love our new baths! We worked with the quintessential Insignia kitchen designer – she has the vision, talent and determination to achieve a masterful transformation. I was most impressed by her incredible blending of beauty and functionality – the space is wonderfully warm and inviting.